I have been using Philips Lumea for over a month now and I couldn't wait to share my progress with you. Why? Because it's going really, really well! As mentioned in my first post about Lumea (here), I am very lazy when it comes to hair removal and due to having sensitive skin, I can only rely on one method - an electric shaver. 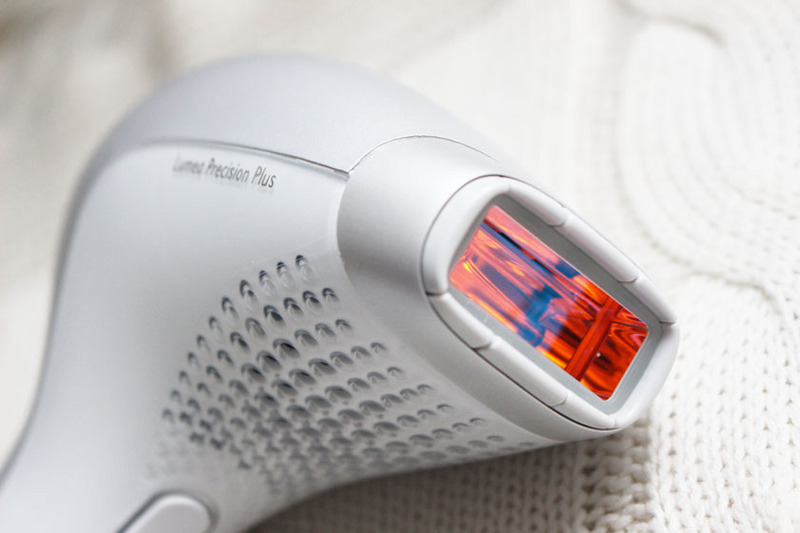 That's why I was very excited to start my Philips Lumea trial. I decided to use the device on my legs, underarms and upper lip, but I ended up doing just the legs and underarms. A little bit of peach fuzz isn't such a big problem after all and tweezers can sort it out quickly. Let's start with the legs. I have to admit - they are the most time consuming body part and you have to be patient and consistent, if you want to see results. I personally find the whole process very fascinating and when I started noticing the results, I couldn't wait for my next session. I have been using it almost every week and about 30% of the hair on my legs is gone! I even have a big bald patch on my shin, where over 80% of the hair is completely gone! I am so happy with the results so far! Each leg takes about 10-15 minutes in total, but it is worth it. I am a big girl though, so I am working with a bigger area. If you have a slim or average built, it will take 5-10 minutes. Why have I decided to use Lumea every week? Well...I have been reading forums and blog posts like crazy and most girls use it every week and have no complications. IPL is a very safe method of hair removal, so longs you are being sensible, it's all fine in my opinion. I am just very eager to get rid of unwanted hair. As mentioned in my first post, I didn't find the process painful at all. I am using the device on level 5 on my legs and level 4 on my armpits. I only had one painful incident, when I flashed the Lumea on my underarm area with a big strand of my hair being caught under the lamp! Ouch! Make sure to keep your hair out of the way. I haven't experienced that on my legs though and it's been perfectly fine. Armpits are more sensitive in general and setting 5 feels too strong and slightly uncomfortable. That's why I am using setting/level 4. Underarms are probably the easiest area to deal with time-wise, as they only take a couple of minutes in total. Again, I am treating them every week and I noticed a 30% reduction in hair growth- yay! My body hair is really dark and quite coarse, so it's very easy for me to see the progress and as mentioned before, I would be happy to just make my hair more sparse, thinner and manageable. So far, Philips Lumea has exceeded my expectations and I am thinking of using it on my bikini area and arms in the future. I actually really enjoy the full process and knowing that the hair will be completely gone at some point (with a little bit of maintenance every couple of weeks) makes me very determined to be consistent with the treatment. I could probably ramble for ages, but I will leave you with my 'how-to' video (see it here).